India’s largest crowdfunding site. Over Rs.548.88 Crores raised. It is said `Cleanliness is next to Godliness`. Efforts have been made by the Union and State government to make every village clean and open defecation-free, but in many villages of Karnataka, people go to open spaces for defecation, primarily due to lack of facilities. 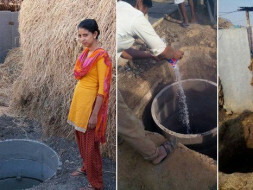 As India tries to make itself completely open defecation free by the year 2019, the biggest stumbling blocks are not the lack of enough toilets, but accessories like water and electricity connections and the difficulty in convincing people to start using toilets. And not only this, it is very hard for poor people to construct toilets with money from their own pockets, because the government subsidy of Rs. 12,000 will be given after the construction of toilet. For people who struggle hard for two square meals constructing a toilet is the least important thing. Hence, we act as a bridge between the local government and the community by helping to disseminate the administration’s messages in the community. We also help the community comply with procedural requirements to become eligible to get microloans from financial institutions, such as opening bank accounts, applying for loan and finally overseeing construction and utilizing the toilet. The Swachhateyinda Abhivraddhi (cleanliness to development) project of our organization is working to eradicate open defecation in rural Karnataka with the help of Suraksha Mud Block, Saravu, Dakshina Kannada, who construct eco friendly toilets which is less expensive. Suraksha Mud Block is working with us in the Swachhateyinda Abhivraddhi project to help us achieve our goal of 100% open defecation-free Ravihal Gram Panchayat for 1,574 BPL (below poverty line) families who do not have the means or the knowledge to access safe sanitation systems. A toilet is constructed for a family, where Suraksha Mud Block constructs toilets, paper work is completed by our organization and finally the sanctioned loan amount is given to the construction company and people can start using their own toilets. We need your support for strengthening the administrative process involved in constructing toilets and for completing Swachhateyinda Abhivraddhi project. 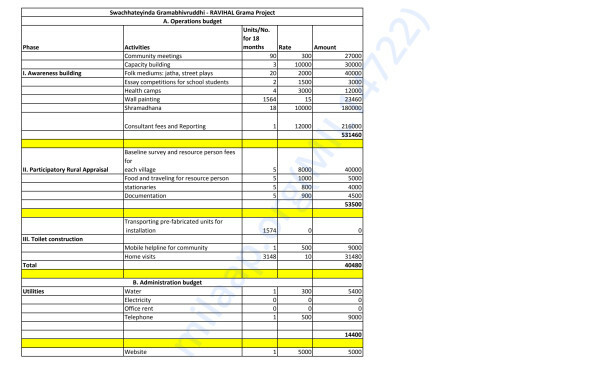 Your donations will help us create a model Gram Panchayat and make our villages look more clean & beautiful. 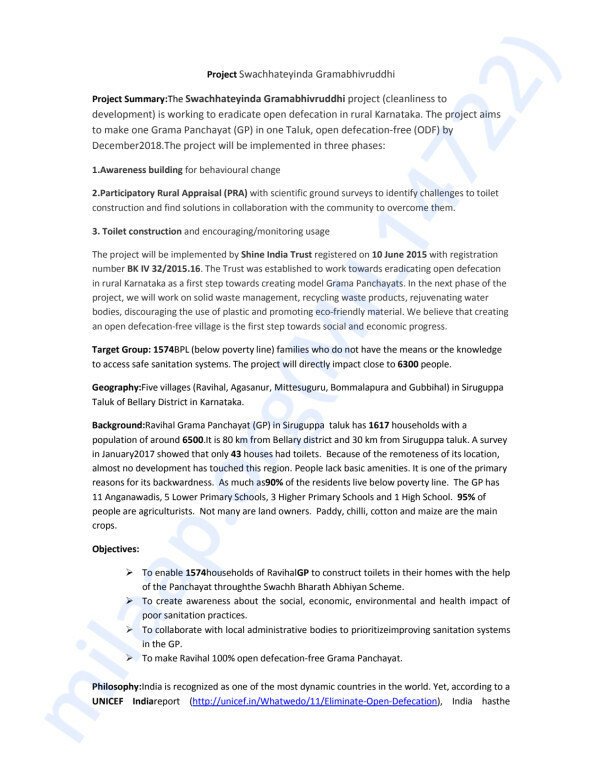 Drawbacks of Shettigondanahalli project made us implement our Swachhateyinda Abhivraddhi project in three phases: awareness regarding toilet usage, water storage, hand washing practices and acceptability of the total idea of sanitation. Focusing on the end result, certain features were introduced to our Swachhateyinda Abhivraddhi project like providing water tanks and electricity for toilets. Water is a major problem in rural areas. Hence it is very important for them to save water for sanitation as well. Providing them a water tank will help them to save water for their toilets. Providing a bulb will allow them to utilize the toilets during the night. After constructing 432 toilets in households of Shettigondanahalli village of Tumakuru district, we realized the fact that people do not use it regularly because it stinks and it is suffocating for them. Hence we started providing them a washing kit after the construction of toilets. The kit will include a bottle of toilet cleaning fluid, a toilet brush and a bottle of liquid handwash. We also teach them to wash the toilets everyday with phenyl, so that it is bacteria free and odour free. This hike was made keeping in mind that hygiene is an important factor and promotion of washing hands at critical times, such as after defecation, was essential to prevent faeco-oral transmission. All your donations will cover all aspects of the idea of sanitation thereby making every village clean and open defecation-free.